Hi there. Welcome to the online home of Pointless TV. My name is Jeff and I'll be your host throughout the site. If you like watching young filmmakers slacking off, you've come to the right place. We have videos, games, and a cute little forum for you to enjoy. Take a look around; You're sure to like it here. Want to know more about us? Make the about section your next stop. Well, I didn't think I'd be doing a PTV update any time soon, but here you go. Thanks to loads of server issues, the PTV videos haven't been very accessible lately. But now, thanks to Petey Boy, we'll always have a mirror location for all of them. The vids are back up now, hopefully to stay. This website has just entered its terrible twos. That's right; today marks the second anniversary of the Pointless TV web site. I know there hasn't been a new news article in a while, but we haven't abandoned the site. Watch for a major structure update soon that will make the site more user-friendly and more functional in general. To get a preview, check out the test versions of the new video and bios menus. The new video and bios pages will load much faster thanks to some bandwidth saving PHP tricks. The code is much cleaner and will update itself as we add new videos or members. Check out how the videos and bios pages automatically cross-reference each other. Now you can see, at a glance, all the videos your favorite PTV member is involved with! Bios will also display the members' forum information when I'm done. I know, I know, what good is all of this if we don't have any new videos? Well, they're coming. I've been working on a stop-motion project, and as soon as his schedule calms down, I'm going to harass Petey to get to work, too. Also, the point of this whole site renovation is so that videos can get more organized and varied. This way, a clip doesn't have to be necessarily for PTV just to get on here. Keep checking back for new stuff! The Vault and Video pages have been updated to include our latest episode. Pointless TV Episode 4, IV, or whatever you want to call it, premiered May 28, 2004 to a standing room only gathering at the Emerald Ball. The crowd seemed to enjoy this, the last episode of our first "season". PTV will be taking a new direction soon. We have no more old skits to use up, we're done ripping off material from other sites, and if we're going to be slackers, we should go all or nothing. So expect something new and exciting from us... eventually. The few new videos from the episode will be added in a few days. To keep up with the progress of the new PTV stuff, check the Notices area in the PTV Forums. Wow! One million hits! That's amazing. Thanks for your patronage, everyone. You shall be rewarded with new videos soon. Just a little update here. With the spring semester at UWO coming to a close, we're moving back to Mayville. As a result, the PTV address has changed back. It's on the About page if you need it. On a side note, thank you to everyone who watched "Cable Access Show: A Documentary of Pointless TV" this weekend. We had 97 unique visitors come to the site after the airing, gained three forum members, and got a video submission. It's nice to know we're appreciated. It's funny to look at some of the Google searches that get people here. My two new favorites are now panasonic convergence template and sony james jvc oshkosh. Crazy. This gave me an idea. Whoever can get to PointlessTV.com from Google using the weirdest search string wins a prize. The weirdness of the search string will be evaluated by Petey and me. The prize? Who knows. It'll probably be something from our CafePress store, and that'll give me motivation to redo some of our merch. Well, we could always do cash, too. Internet Video Magazine has reviewed PointlessTV.com in their Best Video Web Sites of the Week! You can read the article here. Ahh, the sweet scent of recognition! I got bored and realized that I haven't really done any site updates in a while. This neglect was remedied today with the additon of a links section to PointlessTV.com. All of the old links submitted in the forum are there, along with a detailed partner sites list. Check it out! Hello all. There's new cool stuff all over PointlessTV.com now. First of all, you can choose how you want things to look. Just click on a theme in the right column of the page. Default is based on the Odyssey template for phpBB and is brought to you by little ol' me. Charcoal is based on the theme of the same name for phpBB and was ported by our own Petey Boy. Classic harkens back to the old days of Pointless TV (like last month) when the site was in its Blue period. DuelingTrumpets.com is of course a direct rip-off of the Dueling Trumpets website, but it's ok since it was designed by Petey and me in the first place. But wait, there's more. Today marks the launch of the online home of The Joe Show, a public access project by Joe Escobedo. The site is hosted by Pointless TV and was designed by yours truly. Visit JoeShowOnline.com and check it out. Videos to come soon. 2004.02.19 Welcome to the new PointlessTV.com! Pointless TV got a little facelift this week. I've streamlined the menus so that there's no more nesting, and included a sidebar for easier navigation. Hopefully, this will all help to make your stay here a little better. It should be noted that this new theme was inspired by the Odyssey template for phpBB by Will Mullis, although everything but the color scheme is completely original. Odyssey is now the new default forum template, by the way. Any problems with navigation or appearance should be reported to me in the forum. Thanks, and enjoy the new site. 2004.02.14 Who are these people? I get bored easily so I started looking at the access logs for the site. Turns out we're getting a lot more diverse traffic than ever. This intrigues me because I'd like to know who's visiting. So to all new visitors: If you like what you see, click on Forum and go sign the guestbook. It'd help me know more about my audience, giving you better stuff in the end. Everyone wins! Also, the forum got a makeover. Well, actually, it got it's makeover removed. I gave up on skinning it; it was causing too many problems. Everyone's back at subSilver right now, but there are about 5 more themes to choose from. Hmm. According to the US Copyright Office, "Your work is under copyright protection the moment it is created and fixed in a tangible form that it is perceptible either directly or with the aid of a machine or device. " I always thought there was a process involved in real copyright. Shows what I know; Pointless TV has been protected by copyright since we first thought of it. So it's ours. Nyah-nyah. I'm an idiot! All this time I thought that since our web host was having rate hikes, that they would apply to us. They don't! Sweet!!! So instead of costing $150 next year to host PointlessTV.com, it only costs $35. Again: w00t! We've had our share of problems with this host, but there's been more good than bad. And getting 10GB of storage and unlimited bandwidth for only $35/year on some really fast servers is a steal. If you know of something better, let me know. But I'm a happy, happy kid. I have fun making websites. I made this one from scratch, and I helped with DuelingTrumpets.com. I was sitting here, the gears in my head slowly grinding, and came up with the brilliant idea of contracting myself out as a web designer. Since I know of no appropriate venue in which to proclaim my availibility, I just decided to make a wordy news post about it. So if anyone wants a cool website made cheap, I'm your guy. Let me know. What you know as Pointless TV is really the evolution of WWP. Check out our humble beginnings at the WWP page under Goodies. Another WWP by-product is Dueling Trumpets. Petey and I have been working on a site redesign, and are hoping to have short films online soon. Check it out at DuelingTrumpets.com. The top row of links are gone from the forum, and you can get back to the main PTV site from the forum by clicking the PTV logo or clicking "PTV Home" on the forum menus. I'm working up to doing something big on this site, so stick around; things could get interesting. No more ads by Google. They busted us for "invalid clicks". So if anyone has ideas for PTV moneymaking, let me know. On the upside, Google has re-crawled the site and we've got over twice the results as we did before. w00t! Don't you hate it when you see a billion "Image hosted by Tripod" pictures when you try and take someone's file? I used to, until I noticed some bandwidth thieves here at PTV. There is now no offsite linking for any PTV images, audio files, or videos. If this screws up your regular viewing of the site, or if you have a good excuse for stealing space here, let me know. 2004.01.27 Jeff sticks it to the man. I found a way to get the storefront to look more like the PTV website. It's kind of an ugly and partial refit, but it works. If you haven't ever seen the store, give it a look. There will be new items soon. Any suggestions will be taken into consideration. 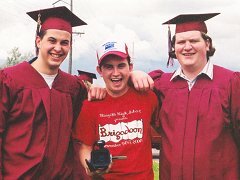 They're the hosts of the 2004 Mayville Film Festival, which is coming up this summer. Get those cameras rolling! I added a Hit Counter to the bottom of every page (except for the forum). And, yes, it's accurate. It shows the results from the raw access log. Bet you didn't know so many people came here, did you? I downloaded Netscape today to see what the site would look like. I'm glad I did. The menus didn't work. I spent a whole night recoding the site to work for IE and Netscape. Have fun. To cheer myself up over the whole hosting dilemma, I did some PHPing. The videos section is now done by PHP, so update your links. Also, if you haven't noticed already, right above this message is a Featured Video. It's just a random video that shows up every time you come to the site. But I thought it was pretty cool. I've been IMed with a request for the links section to return. Well, the links section never left, it just became a part of the forum. Click here to enter The Best of the Web. Have any good websites we haven't talked about? Just sign up for the forum and post one. 2004.01.16 I didn't know I could do this! This is really cool and geeky. I'm updating the news for pointlesstv.com from the forum! All I'm doing is posting a regular message, and it shows up on the homepage. I've always wanted to use php more on the site, since it's a lot easier than HTML for updating. Hopefully, this will soon have more, cool implementations across the site. Oh yeah! See that Comments thing right below this text? Click on it and you'll be taken to the forum to reply to this message. Replies will be numbered on the news page. How cool is that? 2004.01.15 There's no time like downtime. The whole site has been acting up all day. I do not know why, and that bothers me. It's got something to do with our host, but that's all I know. If anyone knows of any cheap web host that's a little more reliable than ours, please say so in the forum. Everything is working again, for now. Putting the videos under the Goodies section seemed like a good idea, but the section grew a lot faster than we expected. Videos are now accessible from the main page, and the store got moved to Goodies to make room. I also added section descriptions to the video list, and made little updates all over the site. Hopefully this will all make it easier to find your way around. Have fun! There's a new PTV video out! Watch Will He Eat It? and find out just what Petey will eat. There's also a new video section. The Freund brothers have allowed us to upload some of their works. Click on Hoboman Productions in the videos section and watch the 8 clips that we've uploaded. 2004.01.02 I Found the Pickle! For some reason, when I was getting clips ready to go online, I left out a holiday classic. Well, I righted that wrong today, and as a result The Chrismas Pickle is now in the videos section. Enjoy. Remember those changes I talked about? If you don't, look at the news item right below this one. Well, I found a use for them right away: now we have a site map. You see that little arrow in the menu above? When you click on it, you'll get a page where every part of PointlessTV.com is just one click away. Check it out. A really cool part of that page? Search! FrontPage Extensions make a lot of things really easy, including a site search. Try it out. Check out the Show Vault, if you haven't already. The image picker is a lot more streamlined now. There's also some little, but useful, changes that you can't really see. Clicking on the PTV logo will take you to this page every time you click it, except when you're in the forums, in which case it intelligently takes you to the forum home page. Also, clicking on the forum link twice takes you to the forum without having to read the warning page. Fittingly, my site changes are becoming pointless. I've gone throughout the site and cleaned up the HTML code. You can't see that I did anything unless you really look. So why did I do it, and why am I telling you? The things I changed make it easier for me to adjust the layout of the entire site. So if you have any suggestions for the site, it would be very easy for me to implement them. Do you have any suggestions for the site? Tell us in the forum. Oh, one more thing. The Talk to Bob Tobor page works again. I had forgotten to update it when I was redesigning. Check it out in the Games section. 2003.12.27 More problems and a solution. We seem to be cursed with server problems. They changed our nameservers, so the site is down until the new ones kick in. Sorry. But you know what I do when a problem like that has me down? I ask Bob Tobor what to do. And, thanks to the wonder of the Internet, now you can, too! Click here to get help. Argh! Christmas Eve, the day I wanted to show a lot of people this site, was the day someone decided to hack our nameserver. So we were down until about 5pm CST Christmas Day. Fun Fun. Well, our web host plugged the hole, and there'll never be an attack like that again, so you live, you learn. Anyway, another update: My cousin Robert Vis now has a PTV bio. Check it out. I also gave the Videos, Bios, and Games sections a little facelift. I used the menu the Videos page had already, tweaked it, and made it easier to tell what clip or page you were actually looking at. Enjoy! Last, but not least, there's a new item on the Games page. You can now take a 3D tour of the PTV studios. 2003.12.24 Merry Christmas! Have a new video. I know I originally said I would have this site up for Christmas, but since I got done early I figured I owed you guys something else. So check out the latest installment in the Fun series, Fun at 12 in the Videos section. Ho ho ho. I did it. I actually did it. I got the site finished! Either way, I hope you enjoy them, and please comment in the forum. I think that's the title of a country song. Interesting. Anyway, things are finally happening here at PTV. It's going to be my Christmas present to everyone to get the clips online and the website completely finished. Right now I'm playing with style sheets, which let me change the look of the website much easier than before. It also lets me customize elements easily that used to give me a very hard time. I like that a lot. What does that nerd talk mean? Well, hopefully this will lead to more frequent updates since it will no longer be such a hassle to make new pages. I know I'm lazy, but at least I'm trying. Just try to bear with me and visit the forum while you're waiting. Yeah, we're back, alright. Our procrastination turned into downright abandonment of all things PTV and for that I apologize. But thanks to some unusually large amounts of uninterrupted free time here at college, I can once again dive into this pointless abyss. Right now there are no immediate plans for new shows, but we have quite a few clips lying around, so depending on how bored we get, we might just decide to churn one out. So stay tuned. The big deal right now is what you're currently stuck on. The website. I just gave it a well-deserved face lift, and hopefully will be adding some useful fun stuff to it soon. Have fun playing with the pretty menus, and keep checking back. I may add more. You just never know. Amazing, huh? I did some much-needed updating. Now you have something to do while eagerly awaiting Episode Two. Check out the new stuff in the store! And actually buy something this time! Talk about groovy! I got the first episode to fit on a VCD. Now you can order a CD that you can play on your computer and most DVD players. This wonderful new compression stuff means online video clips and perhaps live feed will be coming soon! Pointless TV premiered today, albeit 40 minutes behind schedule, at 7:40 PM CST. A big thanks to Mike Kurtz, our homeboy at City Hall for actually driving into town during his vacation to fix the broadcast VCR. This television event was witnessed by many in the basement of Pat Gnerlich. Thanks for hosting the premiere party, Pat! We'll work you into a skit as soon as possible, buddy boy. Hey. I just noticed that I've used "albeit" twice now. What a great word! ALBEIT! That's right, folks. It's 3:05 am and I'm still clicking away. I have a strange desire to keep building this page. I've added to the main page, check out the interviews! I've also got the news, schedule, store, contact, and past shows pages working. So go nuts. I know I will. At least this little corner of it, anyway. PointlessTV.com is up and running, albeit very empty. This makes Pointless TV official, because if it turns out that I built this page for nothing, someone's goin' down. So enjoy, and eagerly anticipate Pointless TV. Our users have posted 3076 articles in 455 topics. We have 87 registered users. I love this clip. The guys were trying to pop one kernel of popcorn in a microwave and cracked the glass it was in. Petey freaks out over the glass, and it breaks in half in the sink. Sure, it sounds dumb now, but watch it, trust me. PTV's parent site, among other things. Check it out. Web Design by DataTiki. Copyright © Pointless TV. All Rights Reserved. If you're reading this, get a newer browser with CSS support and/or stop trying to view my source code!